Probably the most common bed of all the one person single bed is available everwhere. This type of bed is known as twin size in the US and Canada, probably due to it being the size used by most hotels for their twin rooms that contain two beds. In Mexico the name for the single bed is Individual. This size of bed was at the height of its popularity in the 1920's when it was trendy even for married couples to sleep in two single beds. What Size Is A Single/Twin Bed In ...? The twin size bed in North America has two variant sizes available these being the fairly common Twin XL for taller people and the wider Super Single. In Europe there is much more variation in bed and mattress sizes with the 200cm x 90cm being the most common size supplied by pan European retailers. The length of this standard is dictated by the average height in the Northern European and Scandinavian countries which is around 1.80m (5'11") for men. In Southern Europe 190cm and 180cm beds are just as common as the 200cm standard. 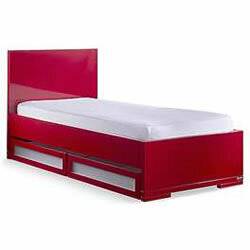 The extra long 210cm (6'7") and 220cm (6'11") beds are only found in Northern Europe. Beds are still sold by imperial measurements in the UK and single beds are generally slightly narrower than in the US. Major variant sizes include the Single Extra Long 0.92m x 2.03m (3' x 6'8") and the King Single 1.06m x 2.03m (3'6" x 6'8"). Long singles are also available in New Zealand with sizes available 90cm x 200cm (0.90m x 2.00m or 2'11" x 6'7") and 90cm x 203cm (0.90m x 2.03m or 2'11" x 6'8"). Another variant is the King Single at 105cm x 200cm (1.05m x 2.00m or 3'5" x 6'7") and 105cm x 203cm (1.05m x 2.03m or 3'5" x 6'8"). Lengths are generally standard at 190cm (6'3") and long at 200cm (6'7") with the widths for single beds varying for the narrowest at 80cm (2'9") to the widest at 105cm (3'5"). The standard Individual bed in Mexico is slightly wider than in most other parts of the world at 100cm (1.00m or 3'3").